Looking to discover your most popular eCommerce products? By figuring out which of your products are the most profitable or popular, you’ll be able to make better-informed decisions to maximize your sales and increase your revenue. In this article, we’ll show you how to find your most popular eCommerce products in Google Analytics (step-by-step). Google Analytics is the most powerful web analytics tool available. It enables you to track almost every user interaction on your site and provides you with insightful reports. 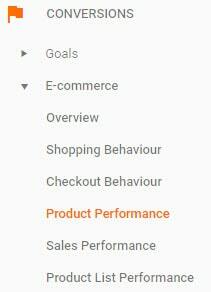 If you’re running an online shop, you can view your most popular products and other conversion stats by setting up eCommerce tracking in Google Analytics. 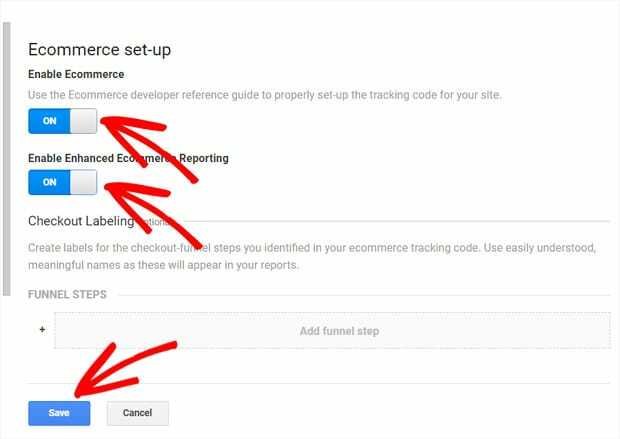 To get started, as you may have guessed, you’ll need to enable eCommerce tracking in Google Analytics. 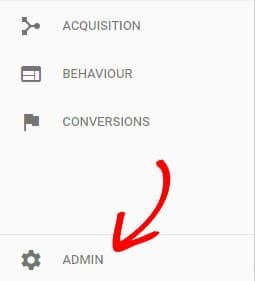 Log into your Google Analytics account and navigate to Admin on the right menu bar. Then, click on it to view your admin settings. Now you can click eCommerce Settings under the View column on the right. Next, click the slider under the first step, Enable eCommerce, to turn it on. Also, turn on the Enhanced eCommerce Reporting. For more information, see our guide on how to enable enhanced eCommerce reporting in WordPress. That’s it! You’ve successfully enabled eCommerce tracking. Let’s proceed to the next step. However, the process of manually adding the code is not an easy task because it’s not just a single line of code you can easily paste somewhere. You’ll need to add several different commands to add transactions, items, sending data, clearing data, etc. Plus, you’ll also need to customize the code to auto-detect the price of the items in the cart, product names, etc. It’s difficult to understand and implement eCommerce tracking setup for non-coders, even after viewing the official documentation from Google Developers. Most likely, you’ll need to hire a developer if you aren’t a developer yourself. Or, you can use MonsterInsights. MonsterInsights is the most beginner-friendly, powerful Google Analytics plugin for WordPress. It empowers everyone, of every skill level, to use advanced Google Analytics features with ease. You just need to enable eCommerce tracking and MonsterInsights handles the rest. To get started, make sure that you’ve installed Google Analytics on your site with MonsterInsights Pro. If you need detailed instructions, here’s our step-by-step guide on how to set up Google Analytics in WordPress. Next, you’ll need to install the MonsterInsights eCommerce addon. 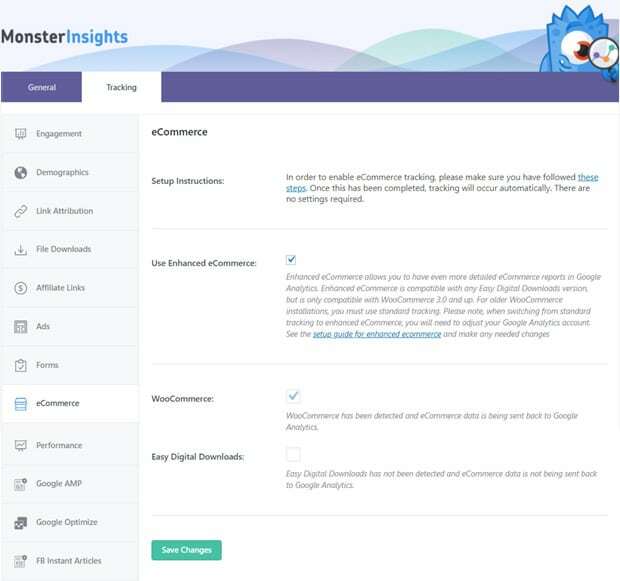 Go to Insights » Addons from your WordPress dashboard menu and navigate to the MonsterInsights eCommerce addon. Then, click the Install button. And, click it again to activate it. You’re almost done. MonsterInsights will automatically detect your eCommerce addon and start collecting your eCommerce data; however, it’s always wise to check and confirm. Go to Insights » Settings and click the Tracking tab. Then, navigate to the eCommerce option and click on it. Now, you’ll see your eCommerce settings. Put a check on Use Enhanced eCommerce to allow the plugin to collect more-detailed eCommerce reports. Then, you may see the plugin you’re using on your WordPress store (i.e. WooCommerce or Easy Digital Downloads) auto-selected. If it’s not selected, you can put check and select. That’s it! You’re done setting up eCommerce tracking in your WordPress online store. MonsterInsights not only saves you the money you would have had to pay a developer, it also prevents the risk of your site breaking down due to unprecedented coding errors. In short: it empowers every WordPress user regardless of their coding skills (or lack thereof). 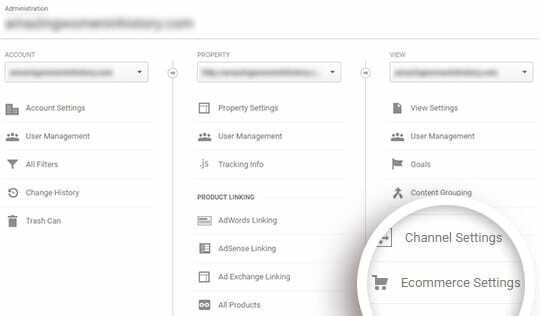 Now that you’ve set up eCommerce tracking, you can view your eCommerce reports in Google Analytics. But you no longer need to open your Google Analytics account to view your reports because MonsterInsights offers all of your important Google Analytics data right in your WordPress dashboard. 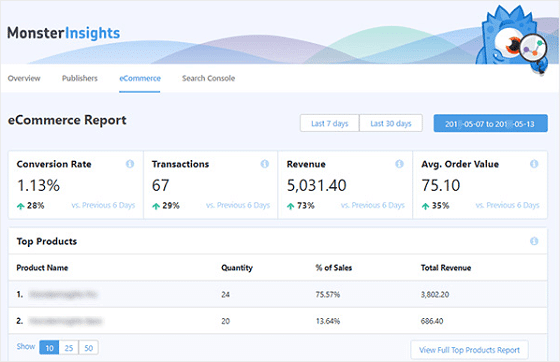 To view your most popular products, total sales, conversion rates, and other eCommerce reports, visit Insights » Reports from your WordPress dashboard. Then, click the eCommerce link at the top. As you can see in the screenshot above, you’ll see your shop’s conversion rate, transactions, revenue, average order value, and your most popular products. It’s simple and easy to understand. 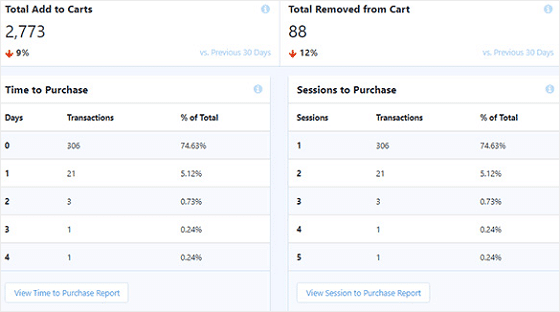 If you scroll down, you’ll see more interesting eCommerce reports like total add to carts, total removed from the cart, time to purchase, sessions to purchase, and more. Now, you can analyze your online store’s performance and build marketing strategies that actually work to grow your business. Viewing eCommerce reports in MonsterInsights’ dashboard is easier and more convenient; however, sometimes you may want to view them in Google Analytics. To get started, log into Google Analytics. Then, navigate to Conversions » E-commerce » Product Performance in the left panel. 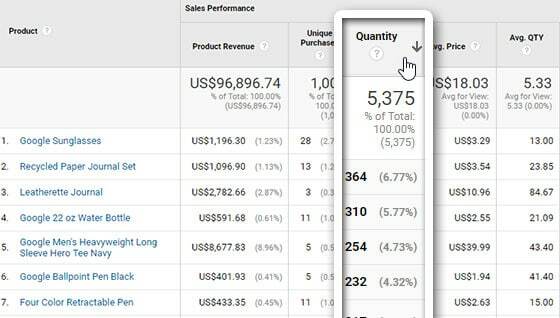 Now you’ll see the sales performance of your products in a table. You can sort the table by quantity, product revenue, unique purchases, etc. by clicking on its respective tab. For example, take a look at the screenshot below that is sorted by quantity. We hope this guide helped you to find your most popular eCommerce products so you can make more money online. If you’re looking to increase your sales funnel conversion rate, take a look at this guide on 18 ways to increasing your sales funnel conversion rate. And don’t forget to follow us on Twitter and Facebook for more Google Analytics tutorials.